If you think you've got an original idea, forget it. In 130,000 years of human history, give or take a few dozen millennia, chances are someone's already had the same thought, the same invention as you -- if only on a smaller, more primitive scale. » Diamond Head Theatre costume shop: A few dresses for women in small sizes; vests and jackets for men. Rent from $35 to $50. At 520 Makapuu Ave. Call 733-0277. » JJ Productions: Period costume rentals, $50 to $95. At 98-021 Kamehameha Highway behind Cutter Ford in Aiea, by appointment only. Call 486-1656. » Kharolina's Designs & Rentals: Full period costume rentals, $35 to $100 plus dry cleaning. At 1059 12th Ave., second floor, by appointment only. Call 732-3423 or Terry at 228-6163. Take fundraisers, for instance. The parties, the auctions and dinners are nothing new. So when the Friends of Iolani Palace were casting about for a stylish new fundraising idea, they simply looked to the example set by former palace occupants King David Kalakaua and Queen Kapiolani. The Friends' Royal Garden Party, taking place next Sunday on the palace grounds to benefit the group's mission of preserving and restoring "the unique cultural, historical, and spiritual qualities of 'Iolani Palace and its grounds," is based on charity events hosted by the queen. The event is intended to whisk guests back to the late 19th century, when men were men, women were ladies and there was always a charitable cause worth helping. 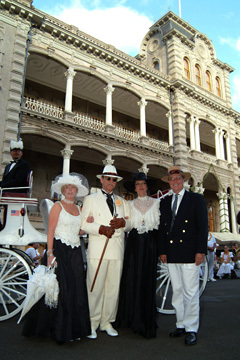 "We're trying to be faithful to the ambience of the time and encourage people to wear attire that lends itself to that era," said Alice Guild, president of the Friends of Iolani Palace. That would be the late Victorian and Edwardian eras, spanning 1882 to 1910 -- preceding the sinking of the RMS Titanic, the Jazz Age and the arrival of flappers -- when fashion rules were few and easy for all to follow. Cool, heat-reflecting white was the logical color of choice for Hawaii's hot summer days. "Luckily, white is in style again," said Guild, who said that many men donned white linen suits for the last garden party, held four years ago as one of the organization's annual rotating fundraisers. "We have a lot of information about the royal parties from newspaper accounts and photographs in the State Archives," Guild said. "We're still using research that was done over 35 years ago by the Junior League of Honolulu. That's the beauty of research. We have many records of music that was played and the food that was served; that was one of the things newspapers loved to print." The royal parties were not always as formal as one would imagine. With no need to impress the neighbors, the monarchs could be as casual as they pleased. In 1892, Queen Kapiolani celebrated the third anniversary of Kalakaua's coronation by hosting an ice cream and cake party. 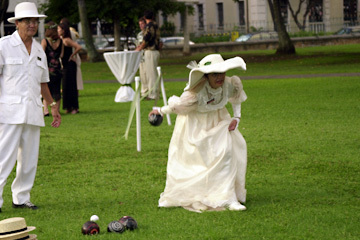 Lawn bowling was one of the sports at the first Royal Garden Party in 2002. In 1886 the cream of Honolulu society, including Princesses Liliuokalani and Likelike, businessmen, foreign ministers, judges and clergy, were treated to the sounds of Hawaiian national music and a Grand Poi Luau to benefit those suffering from leprosy. A lemonade table, ice cream table and Hawaiian dinner table were auctioned, raising a grand sum of $413 for the cause. This time around, food stations will be set up on the palace grounds with luxurious cuisine catered by Current Affairs, dancing by the light of Japanese lanterns, and the Friends will be bringing back such genteel sports as lawn bowling, croquet and badminton. Only the cost of a ticket, at $300 per person, will nudge you back to the present.